The Dogon people are one of the most fascinating sources of evidence for Ancient Aliens. The Dogon populate the central plateau region of Mali in Africa, there are said to be between 400,000 and 800,000 in this remote civilization. The Dogon culture has been known for its dramatic art, tribal customs, and most of all their cosmology. The controversy started in 1930 when French anthropologists recorded a strange legend from Dogon priests. Passed down through oral tradition, the Dogon told a tale of alien visitation from the Star System of Sirius. The alien race was referred to as the Nommos and was said to be an aquatic race of humanoid creatures (from their descriptions similar to Mermaids or Mermen). Interestingly enough the Babylonian god Isis, is often depicted as a Mermaid and associated with Sirius. According to the legend the Nommos descended from the heavens in a great “boat” that was accompanied with much noise and winds. The anthropologist recorded the story for what it was worth and went about their business. However, an interesting fact emerged from the story years later. 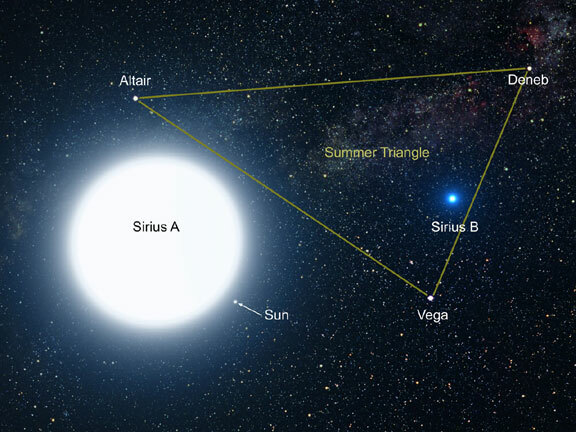 The Dogon explained that the Sirius system had a companion star, which is invisible to the naked eye. In 1970, astronomers were able to photograph Sirius B, the companion star to Sirius A. Sirius A is the brightest Star we can see from Earth and rests only 8 light years from Earth, which is relatively close by cosmic standards. Sirius B happens to be a very heavy white dwarf star about the size of the earth. White dwarfs are formed when stars run out of fuel and collapse on itself, and are not large enough to supernova. Sirius B is a small, cool, and very dense star gravitationally bound to Sirius A and part of the same solar system. How could this ancient culture have known about this amazing astronomical feature before modern technology discovered it to be true? One possible explanation is that the Dogon had enough contact with Western culture they were able to hypothesize the existence of Sirius B (after all astronomers were speculating its existence since 1890s). More recently, however, researchers have found artifacts dating back over 400 years made by the Dogon depicting orbits of these stars. Additionally, the Dogon have held ceremonies every 50 years celebrating the cycle of Sirius A and Sirius B. Astronomers later verified this cycle to be quite accurate. The Dogon have been holding these celebrations ever sense the Sirians came to visit them. The Dogon also identify a third star in the Sirius system they call “Emme Ya”. Astronomers have yet to verify the existence of this smaller body. With the brightness and size of Sirius A, a smaller star would be very difficult to track down, let alone the planetary system which evidently services the stars. The Dogon were also able to identify the moons of Jupiter and the rings of Saturn, seemingly without the assistance of a telescope. The Dogon people defy common logic and tradition. However, “logic” and “tradition” has convinced millions that the world was flat, the Earth was at the center of the universe, and that man could never fly let alone walk on the moon. Researchers of extra terrestrials have always felt a faint pull towards the star system of Sirius, a faint pull that one could only interpret as a distant memory….